Very Rare Vintage 1992 A Starry Night With Simply Red UK Tour T-Shirt. Very Rare Vintage 1992 A Starry Night With Simply Red UK Tour T-Shirt. - Very Rare Vintage Band / Tour T-Shirt. - Label states Size X-Large (Please Refer To Measurements). - Simply Red UK Tour. - 1992. - Birmingham February 22, 23, 24. - 100% cotton. - Awesome Stars Graphics. - Image of uk tour dates on the back. - Very Good condition for its age. - Vintage Bright Green Label. - Measures 22 inches Pit to Pit (Approx). - Measures 33 inches Top to Bottom (Approx). - Free UK Postage. - Please enquire for worldwide shipping. Portion - effectively removing the counterfoil had there been o ne attached. Whilst Royal Albert Hall Tickets did not have "tear-off" counterfoils during this era. the door staff would rip Patrons' tickets in Half upon entry - leaving the Seat number. "SIMPLY RED " A NEW FLAME WORLD TOUR PROGRAMME, 1989. You are looking at a fantastic huge signed photograph display. We are AFTAL (Autograph Fair Traders Association Limited) Approved Dealers, number 165. Why buy your autographs from anywhere else?. 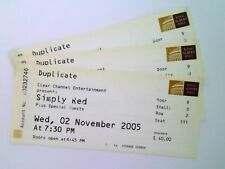 Simply Red Life genuine concert program. 24 colour pages with substantial information and photographs. In good condition with protective cover. Also, two tickets (see photos). Please see my other items for sale as postage can be combined to save you money. 13 CUTTINGS. includes a 2009 Interview. SIMPLY RED. Simply Red Picture Book Promotional Postcard Good Condition Unposted . Condition is Very Good. Dispatched with Royal Mail 2nd Class. This will give it an excellent reproduction in both colour and sharpness. Wooden Coaster Set. 4 Coasters Per Set. The 3 Large Interview Cuttings are Folded once across the centre. SIMPLY RED. VERY GOOD & EXCELLENT CONDITION. Great for any fan/ collector. Title: SPIRIT OF LIFE TOUR. Country: UK. Artist: SIMPLY RED. Country: UK. Artist: SIMPLY RED. Title: STARS. Label: EAST WEST. Country: UK. Title: NEVER NEVER LOVE. 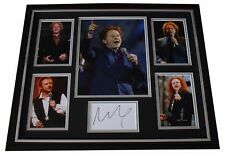 SIMPLY RED Love And The Russian Winter CARD UK East West 1999 12" X 12"
Title: LOVE AND THE RUSSIAN WINTER. Label: EAST WEST. Year: 1999. Country: UK. Artist: SIMPLY RED. Title: FAIRGROUND. Label: EAST WEST. Country: UK. Format: FLYER. Country: RUSSIA. Condition: EX. Inside the Red Box issue 19 from 1995 issues 20,21,from 1996 issue 22 from 1997. From the Simply Red Information Service. SLIGHT RUBBING TO COVER. Year: 1990. Country: UK. A Platinum LP Presentation Disc. producing Gold, Silver and Platinum Disc Presentation Awards. PLATINUM LP DISC. Suppliers of Bespoke Presentation Awards. With the genuine Vinyl Album. With an engraved polished silver bevelled edged plaque. Great concert! Simply Red 1989. Size 28 x 28 cm. Label: OMNIBUS PRESS. Title: AN ILLUSTRATED BIOGRAPHY. Year: 1993. Country: UK. Title: GREATEST HITS. Label: EAST WEST. Year: 1996. Format: FLYER. Country: RUSSIA. Year: 1998. Artist: SIMPLY RED. Simply Red 1989 A New Flame World Tour Programme Fair condition for 28 years old! Scuffing to cover and various creases/ marks - see pictures for further info.